L-R- Middle Row: Charles Kettles, Paul Bucha, Robert Patterson, Gordon Roberts, James McCloughan, Pat Brady, Michael Fitzmaurice, Drew Dix, Hershel Williams, Jay Vargas, Harold Fritz, Robert Modrzejewski, James Taylor, Bennie Adkins. 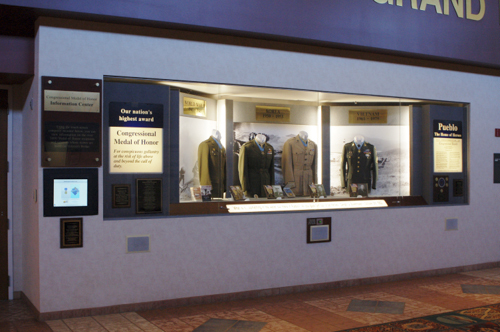 The display inside the Pueblo Convention Center honoring Pueblo’s four Medal of Honor recipients has be updated. The three faded background photos have been replaced, all new LED lighting has been installed, attractive fabric has been installed over the floor and a new light and sound controller installed. The most noticeable change is how much brighter the overall display is due to the new lighting. May 6th the 7th annual Home of Heroes Golf Tournament was held in Pueblo at Walking Stick Golf Course. 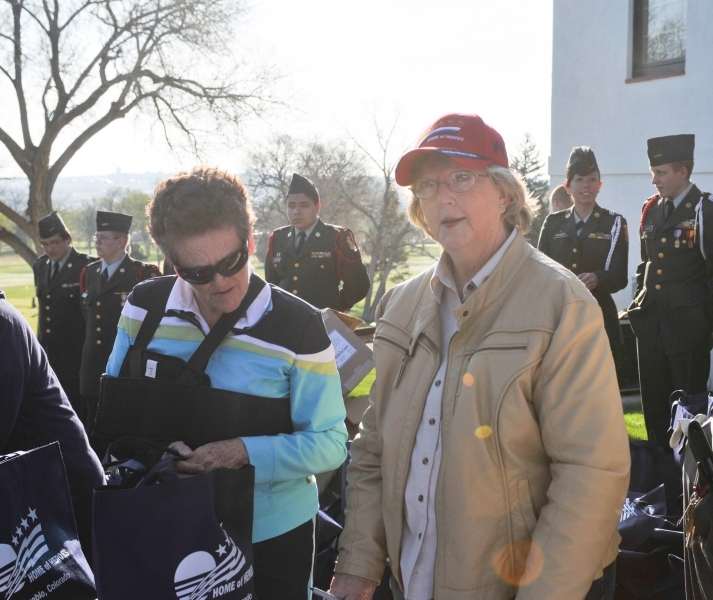 Forty Ft. Carson soldiers were guests for the day of golf and played on scramble teams with over 70 local players. Medal of Honor recipient’s Drew Dix and Michael Thornton were on hand to participate in the festivities. The Pueblo Home of Heroes Association would like to thank the Tournament Sponsor, Major Sponsors, Team Sponsors, Military and Hole Sponsors, Donors and players and those who helped with the tournament. A special thank you to Chad Novak Tournament Director, Pueblo Fire Department, Centennial High School ROTC Color Guard and Pam Cress, Photographer. 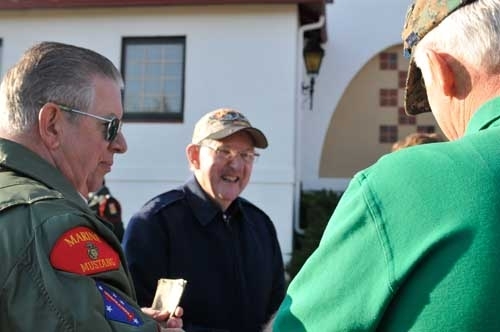 Medal of Honor recipients Drew Dix, Salvatore Giunta and James Taylor were in Pueblo for the 4th Annual Home of Heroes Golf Tournament which is a fundraiser for the Pueblo Home of Heroes Association. The 5-man scramble was held at the Pueblo Country Club Golf Course on Pueblo’s northside. Joining the three recipients was national championship golfer Dave Stockton who helped add a special touch to the tournament by holding a golf clinic for participants. Sixty nine guest soldiers from Ft. Carson mixed in on teams of local and regional golfers all of whom wanted to honor our military at this event. Several wounded warriors were present on the course showing grit and determination by keeping up with, and in most cases, doing better than the best golfers. One hundred and eighty players were on hand for this event on a beautiful sunny day. 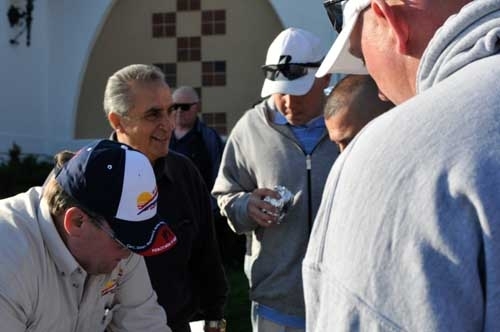 Tournament Chairman Abel Manzanares was very pleased with the entire event. The tournament got a kick start the night before by partnering with the Center for American Values. MOH recipient Drew Dix, one of the founds of the Center was responsible for bringing Taylor, Giunta and Stockton to Pueblo. He and the Center chose Thursday evening to unveil a portrait of recent Medal of Honor recipient Leroy Petry. Petry, who is recovering from surgery, was unable to attend but sent his regards and promises to be in Pueblo sometime soon to see his portrait hanging with the other 147 in the Center for American values. The evening was also highlighted by the premiere of several newly composed patriotic songs by Overton Road, a popular Pueblo area band. 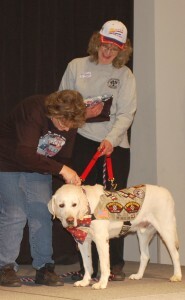 Saturday, April 13, 2013 The Pueblo Chieftain PET EXPO welcomed a four-legged hero. Carlos, a 9 year old Labrador retriever. Carlos has worked as a bomb detection dog for military contractors in both the Afghanistan and Iraqi theaters. He is credited with saving hundreds of lives. Colorado Springs resident Ruby Ridpath, who has adopted Carlos, explained that being a contract dog Carlos was retired and adopted out to an Afghan home but was abused and neglected. When the contractor found that out he reclaimed Carlos. The Military and Contract Working Dog Adoption non-profit agency then began looking for a home for him. Ridpath was overjoyed when she and her family were able to adopt Carlos, although since then Carlos has had some serious cancer and throat problems. Ridpath is hoping that Carlos will be recognized nationally as ‘hero dog of the year’, an award sponsored by the National Humane Society. Voting begins May 5th. 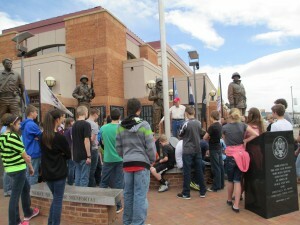 Approximately 220 students from District 70 Connect School spent the afternoon of Thursday April 4th or Friday April 5th as the history classes switched between learning about why the Medal of Honor Memorial was created and then outside to hear about the creation of the larger-than-life statues. These middle school students had recently been to the Center for American Values where they learned of the importance of the Medal of Honor and viewed the portraits of valor exhibit there. Paulette Stuart, a Pueblo Home of Heroes Board member spoke inside telling the group about the task of creating a memorial suitable for these men. She talked of the process of deciding what to do and then setting about with the help of many in the community to not only create the memorial but unveil it with 97 or the 147 Medal of Honor recipients here for the Congressional Medal of Honor Society’s Annual Convention in 2000. .Jim Stuart, a Pueblo Home of Heroes Board Member, talked with the students about the creation of the sculptures by local artist David Dirrim, as well as pointing out the special things added to each sculpture as requested by the recipient himself. Stuart pointed out that it is unusual that a sculptor gets to interview and get to know his subject. WHAT ONE WORD BEST DESCRIBES THE UNITED STATES OF AMERICA AND WHY? 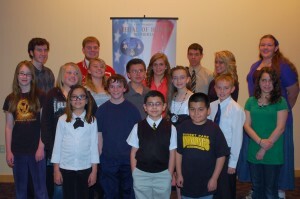 The fifth annual Pueblo Home of Heroes Essay Contest began in January. The contest, sponsored in partnership between the Pueblo Home of Heroes Association and the Pueblo Library District is open to all youth in School District 70, Pueblo City Schools and home schooled or at private schools. The Essay Contest is in three age areas: Elementary, Middle and High School. The first place winners received $100 cash, second place received $75 cash and third place received $50. In addition each category had several Honorable Mention awards. Each student received a certificate, and a Medal of Honor Quotes booklet. All participating students receive a Certificate of Participation from the Pueblo Library District. WHAT MAKES ME PROUD TO LIVE IN THE UNITED STATES? 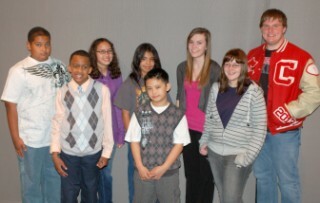 The Pueblo Home of Heroes Association announced the winners in the 4rd Annual Essay Contest on March 16th. It was co-sponsored by the Pueblo City/County Library District. This year’s theme “What Makes Me Proud to Live in the United States?” brought nearly 400 student essays to be judged in three age categories: elementary, middle and high school. The first place winners received $100 cash, second place received $75 cash and third place received $50. Several categories had Honorable Mention awards. Each student received a certificate, and a Pueblo Medal of Honor T-shirt or baseball cap. We applaud each student for taking the time to enter this essay contest, for the thoughts behind your messages and your grasp of what makes you proud to live in the United States. To the teachers and principals who encouraged the students to participate we thank you for dedication to our youth. Parents and grandparents a special thanks for encouraging your child to compete in this contest. Thanks to John and Nadene Verna who championed the essay contest first in 2000 and brought it back to life in 2009. The Vernas and Neta and Eddie DeRose donate the contest prize money each year. A SPECIAL THANKS! Our third annual golf tournament was held on Friday, May 11th. The Pueblo Country Club golf course was the site for this tourney, and was festooned in red, white and blue flags and banners, thanks in part to the patriotic homeowners surrounding the course. We had 175 players, of which 60 were Ft. Carson soldiers half were recently returning from Iraq and some were from the Wounded Warriors program. Medal of Honor recipient Salvatore Giunta again joined Pueblo Medal of Honor Recipient Drew Dix and they enjoyed time on the course meeting the players.Because of generous donors we were able to reach our goal of purchasing not one, but TWO motorized all-terrain carts suitable for physically challenged from the Wounded Warriors program at Ft. Carson. They will be able to have the freedom to hunt, fish, or enjoy the out of doors despite the terrain. 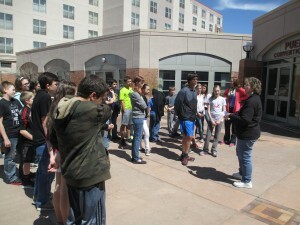 Our programs range from the upkeep on the Medal of Honor Memorial and inside display at the Pueblo Convention Center to sponsoring an annual student patriotic essay contest, collecting and adding biographies to the data base at the Veteran’s Bridge, being the financial agent for painting of the Pueblo Fire Engines with a patriotic theme, and working in various ways to promote honoring all veterans. All of these programs will be enhanced thanks to the proceeds of this tournament. Our second annual golf tournament on Friday, May 13th was a great success. The Pueblo Country Club golf course was the site for this tourney, and was festooned in red, white and blue flags and banners. We had 146 players, of which 60 were Ft. Carson soldiers half were recently returning from Afghanistan and half were from the Wounded Warriors program. We raised approximately $10,000 this year. 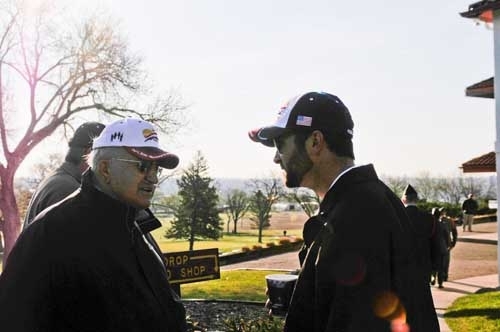 Newly awarded Medal of Honor recipient Salvatore Giunta was a guest at the tournament thanks to Pueblo Medal of Honor Recipient Drew Dix and he enjoyed time on the golf course meeting the players. A dinner was held that evening at the Pueblo Convention Center and featured speaker was Retired Air Force Colonel James Moscghat who spoke about “Ten Lessons of a Janitor” a story about Pueblo Medal of Honor recipient Bill Crawford who after retirement from the military took a job at the USAF Academy as a janitor, just to be close to young military people. Pueblo East High School teacher Raymond LeMasters III was honored with the first Pueblo Home of Heroes Association PATRIOTIC CITIZEN OF THE YEAR award for his work with students especially at East High regarding patriotism and understanding the role and importance of the military.